One of the primary diagnostic tools we use at Delroy Park Dental Care is dental X-rays. While taking X-rays is the actual process we use to obtain images of your teeth, the actual images are called radiographs. 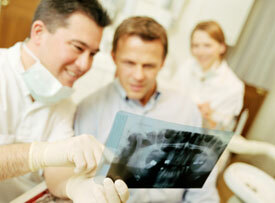 X-rays help to determine whether dental treatment is necessary. Your individual schedule for periodic radiographs depends on many factors, including age, prior history, and certain dental conditions. If you can’t remember the last time you had X-rays taken, it’s probably time to give us a call to determine whether you’re due (or long overdue!) for a new set. There is only so much of your teeth and gums that we can see through a visual examination. However, X-ray images can alert us to all types of conditions, such as tooth decay between teeth or under existing fillings, gum disease, bone infections, abscesses, problems with teeth formation, and even tumors. When we can identify these types of problems in their early stages, we can save you pain, discomfort, money and extended care in our office. Discovering serious conditions, such as tumors, may very well save your life, so the small amount of radiation that you are exposed to during the X-ray process is minimal when compared to the benefits of having them taken! Bitewing X-rays – generally taken during all first visits and periodically afterwards. They are useful for identifying cavities between teeth and show the area of your top and bottom teeth, from the crown (tooth surface above the gum) to the jaw. Periapical X-rays – show the entire tooth, including the root and bone, to assess whether an abscess, impacted tooth or bone damage from gum disease is present. Occlusal X-rays – show the floor and roof of the mouth and are taken from a position of looking down from the nose or up from the chin. They are used to locate additional teeth or teeth that have not yet erupted, abscesses, jaw fractures, or various types of growths, such as cysts. What Do Radiographs Mean to Me as a Patient? Radiographs serve as the starting point for a detailed dental treatment plan to address any of the issues indicated by the radiographs. They are an important diagnostic tool designed to identify conditions that, if left untreated, can cause a great deal of pain and money – neither of which is pleasant! We recommend that you call us to determine whether it is time to schedule a routine dental care visit, which would include any necessary X-rays. At Delroy Park Dental Care, we care about your dental health. Shop 2, 1 Torvean Ave.